Sean Kavanagh scored Racers' final goal of an arduous campaign. Less than 40 hours after losing out to Atherstone in the Birmingham Midweek Floodlit Challenge Cup final, Racing Club Warwick brought the curtain down on the campaign with a 5-1 defeat at Littleton. 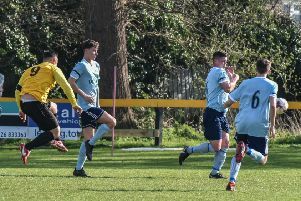 Having already secured fifth place in the Midland League Division One - their highest finish in a league since 1989 - a threadbare side battled to try and end the season on a high. With Scott Davis making his debut in goal, Warwick started brightly but top-scorer Sean Kavanagh fired over when well placed. Despite having the best of the early possession, Racers fell behind when Dan Carter robbed the visitors’ back-line to score. Carter doubled the lead with a free-kick after Davis had been adjudged to have picked up a back pass. Racing Club now looked every inch a side who had played 20 games in five weeks and Littleton threatened to run riot. Davis made two fine saves either side of the break but the home side doubled their advantage just past the hour with two goals in three minutes from Robbie Agar. Racers gained a consolation thanks to a cheeky backheel from Kavanagh but Littleton had the final say when Martin Hutchcox chested the ball into his own net with the last action of the match. Racers’ awards evening took place at Townsend Meadow on Saturday evening with Martin Slevin named the fans’ player of the season and Luke Cole picking up both the players’ player and managers’ player of the season accolades.